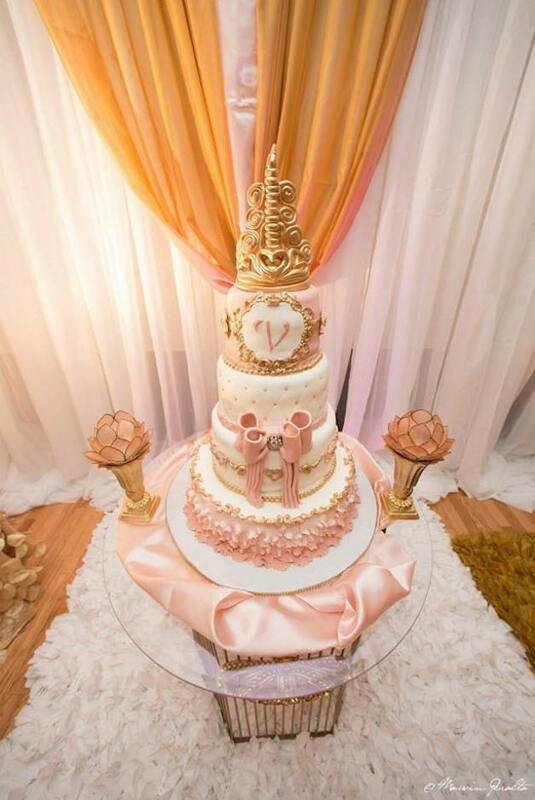 This blush and gold royal birthday celebration was beautifully planned by Bee-unike Events. Your vision, is their mission! Weddings, Sweet 16, Quinceñera, Birthday of all ages, Baptism, Graduations, Corporate Events … they can do it all! We found these gorgeous pictures on Pinterest posted by BirthdayPartyIdeas4U, a place for Birthday Party inspiration. You can see more events designed by @beeunikebyevelyn on instagram. The guest tables were decorated to welcome the royal guests. 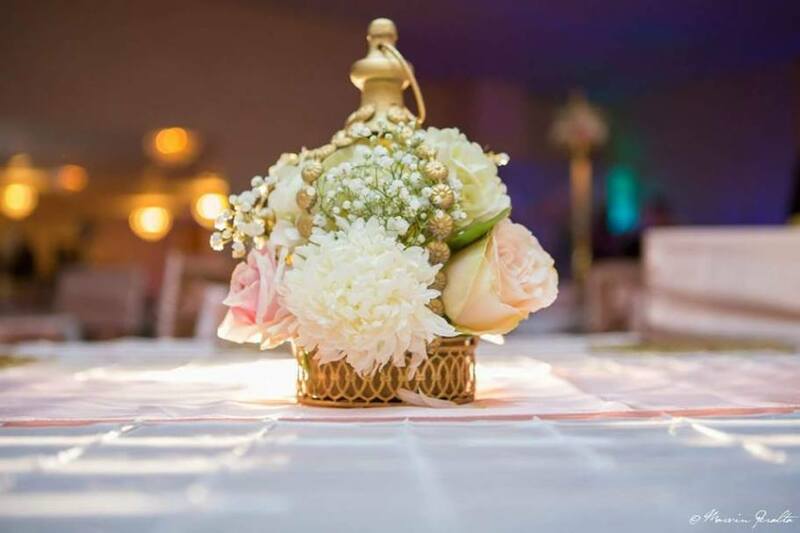 The center of each table featured a tall gold pedestal with an elegant pink and white flower arrangement on the top. The tables were covered with beautiful white satin tablecloths. The dessert table was full of sweets that were fit for royalty! Elegant cake pops with gold crowns were placed on Opulent Treasures gold chandelier cake stands. Blush roses in a gold crown sitting on a cherry blossom cake stand in gold made a regal floral arrangement. Opulent Treasures tiered dessert stand stacked on another cake stand (also by Opulent Treasures) displayed cupcakes and more cake pops! This is a lovely way to create height on your dessert tables! The entire collection of Opulent Treasures works wonderfully together to create beautiful dessert tables. Shop the entire collection here! The background of the main table featured long white curtains with a sheer gold curtain draping down the center. The entire table was exquisitely decorated with a cascade of golden flower petals. On one side of the table was a small sitting area with a white plush rug and gold furniture covered in pink flower petals. A stunning tiered birthday cake was elegantly decorated with a pretty pink fondant bow, gold accents and blush ruffle petals. Blush and gold is always a popular theme whether for birthdays, baby showers, bridal showers or weddings.